I saw this first in an incredible Pakistani blog on the matrial law shared by fellow Kafila-ite Mahmood Farooqui. LAHORE, Nov 15: A large number of Punjab University students on Thursday held a protest demonstration against Islami Jamiat Tulaba (IJT) for its manhandling of Pakistan Tehrik-i-Insaaf Chief Imran Khan. The CPM mask is off. 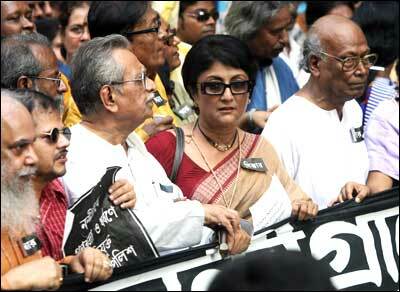 Beneath it you can see the face of the totalitarian face of the Biman Boses, Benoy Konars and Brinda Karats. 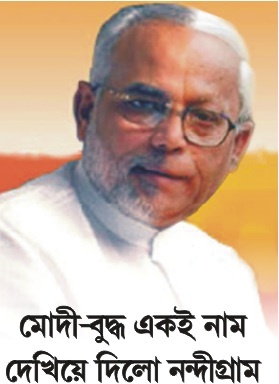 Much more is to come in coming days but one thing seems to be becoming clearer with each passing day: it will be wrong now on, to count the CPM as a Left wing force (at least in West Bengal). Unless we are able to shed this misleading idea, we are likely to misread the situation in the state completely. The situation in Nandigram is developing rapidly. The area has been ‘liberated’ – which is to say brought under CPM control. Nobody, including journalists and political and civil rights activitsts can enter the area. All you have are marauding criminal gangs of AK 47 (and other assorted weapon) wielding ‘cadres’. They roam about with the red flag and have no compunction in attacking the likes of Medha Patkar and Anuradha Talwar, punching them in the face and tearing at their clothes. This is a political style and culture that we have so far only associated with the fascist right. We have seen glimpses of it in the recent past in the state but now it has assumed a generalized form. And while the armed gangs are at work in Nandigram, the state’s police has started targetting protestors in Kolkata. There has been a flood of reports of alleged brutal killings, disappearances and arrests as the military in Myanmar stamped out the anti-government protests of the last week. 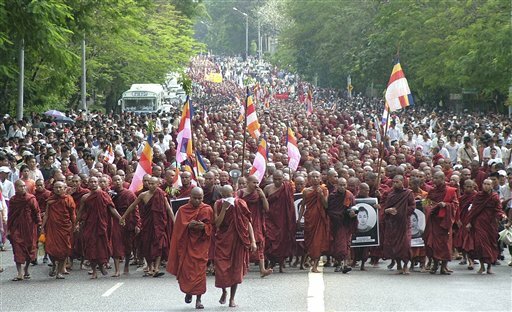 At least 1,000 people have been arrested in Yangon alone, the majority of them monks. Arrests are also reported from towns and cities across the country. This is in addition to at least 150 other persons arrested in August at the onset of the protests. Numerous key figures in the National League for Democracy, the main opposition party, and other activists are among those arrested. However, it remains extremely difficult for anyone to confirm details about who has been arrested, where they are held, why and under what circumstances. This uncertainty is partly as a consequence of restrictions on internet and phone use.